My goal with this page about Hungarian paprika is to share some interesting and useful information with you about this famous hungarian spice. If you would like to know more about this sensational herb and you are interested in where it comes from, what the story is behind it, how healthy it is or where you can buy the highest quality paprika, just follow me on this page and I’ll show you all these things. As I mentioned on our Hungaricums page, the so-called “red gold” is the spirit of the traditional Hungarian cuisine. If you are interested in the Hungarian food specialties, please visit our Hungarian foods web page. You can find lots of excellent and tasty traditional recipes here, which are mainly based on paprika. The red paprika originates in South Mexico, Central America and the Antilles Islands. The aboriginal Indians used it for healing and seasoning as well. The paprika arrived in Europe from the New World with Christopher Columbus. He wanted to reach the east Spice-Islands on the sea and he returned with unknown spices—for example—with a never-before-seen present: a paprika plant. In the beginning the red pepper plant decorated baroque gardens of gentles in Europe, and it arrived on trade ways to Turkey as well. From there it came to Hungary through the Balkan. In the second half of the 16th century, Margit Széchy, a noble lady, already had a plant in her garden called the Turkish pepper (at that time also called Indian pepper or heathen pepper). The name ‘paprika’ came from the 18th Century as a diminutive form for the south-slavish name of pepper (papar), then after the Hungarian usage, the word became international and universal. In Hungary, paprika was first used as a cure for intermittent fever; it later became a typical spice of Hungarian cooking. 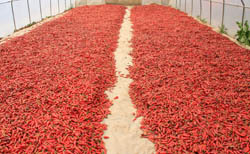 While production remained for the means of family supply until the middle of the 19th century, by the turn of the century processing became serial and paprika trade important. The paprika cultivation started in the region of Szeged, on the black-sand-soiled fields near to Szeged, on the flooded soil of river Tisza. In 1934 Szeged and its area was declared a closed zone, so paprika powder from outside of this area was forbidden to sell as Szeged paprika. The harvest was done in the traditional way, by hand picking that had to be repeated about 3-4 times to assure that only the stalk-ripened pods of excellent quality would be forth processed. A famous picture connected to Szeged is red pepper strings hanging on the walls of houses. 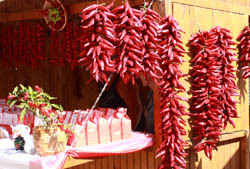 The genetic basis of the exclusive quality of Hungarian paprika is constituted by state accredited paprika species improved in the Szeged region.These species accommodated best to the nature of the region, because during their improvement they used the original taste, aroma, colour giving paprika population, which developed in this area during the century. How paprika powder is produced? There are two main paprika production places in Hungary: Szeged and Kalocsa. The unrivaled Hungarian paprika is made by milling of the ripened, after-ripened, and dried pods of traditional cultivated paprika grown on fields surrounding Szeged and Kalocsa, which are favorable areas for growing the plant. The Hungarian paprika has its special features due to the care throughout the centuries, to the professional knowledge and the traditional processing regarding red pepper, and the conditions that are very favorable in Hungary for the warm-loving paprika. In the Szeged and Kalocsa region the temperature, sun, and rainfall circumstances are the most favorable of all the agricultural lands for red pepper cultivating. I think we all know that today’s people need vitamins and antioxidants in an increased degree because of the changed environment. We Hungarians use red pepper mostly for seasoning in cooking, but the vitamins and antioxidants in it help to keep our health too. I’m sure that you have heard about Albert Szent-Györgyi, who got the Nobel Prize because he discovered the vitamin C. You might be wondering, “how is he connected to Hungarian paprika?” the answer is very simple. He discovered the vitamin C in the paprika. 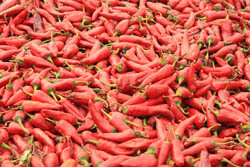 Though color giving carotinoids, provitamins, tokoferol substances in the paprika seeds are materials of the 21st century. Paprika was earlier used as a medicine as well, today they produce noteworthy healing preparations out of it too, and I think in the future we can use Hungarian paprika as a spice for health. You can purchase original Hungarian Paprika here on our site. If you leave in US this is a very good oportunity to try out this unforgettable paprika. Just click on the pictures below and you will enjoy this unbeateble Hungarian speciality very soon. If you visit Hungary, there is a very nice place where you can find original and best quality Hungarian paprika. 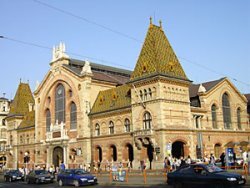 This place is the Central Market (Központi Vásárcsarnok) in Budapest. It is a very nice looking historical just next to the Danube river. There is an unforgettable atmosphere inside, when you are walking through between the small shops you will get the feeling how we Hungarians like to shop. If by accident you miss the Central Market, don’t be disappointed. You can find paprika also in big shopping centers and as a last chance there is still the airport shop. Of course the best would be if you could visit Szeged, the home town of Hungarian paprika. You can be sure that here you can buy very good quality paprika everywhere!